Robert Plant performed a series of Elvis Presley covers at a 70th birthday party celebration for his ex-wife, Maureen, on November 23 and video from the event has surfaced online. 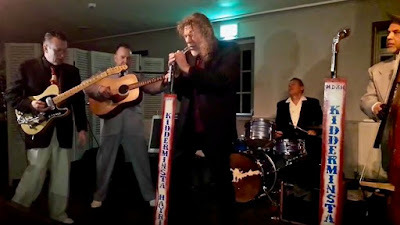 The rocker joined local band The Hayriders at The Fox Inn in Stourton, UK for three Presley classics, including "One Night With You", "Little Sister" and "A Big Hunk O’ Love." Plant married Maureen just prior to Led Zeppelin’s official London debut at The Roundhouse on November 9, 1968; the couple had a daughter and two sons. In August of 1975, most of the family were involved in a car accident on the Greek island of Rhodes, with the band forced to cancel tour dates in support of “Physical Graffiti” while the singer recovered. The extended downtime saw Led Zeppelin work on their 1976 release, “Presence”, with Plant recording vocals for the project in a wheelchair. While Led Zeppelin were on a North American tour in 1977, Robert received news that their five-year-old son Karac had died suddenly from a stomach virus; the band shut down the trek as the singer returned home to the UK. Led Zeppelin recorded “All My Love” for 1979’s “In Through The Out Door”, as a tribute to Plant’s late son. Robert and Maureen divorced in 1983, with the singer going on to have a relationship and son with Maureen's sister, Shirley Wilson, in 1991. Plant recently completed a world tour in support of his latest record, “Carry Fire”, while Led Zeppelin launched their 50th anniversary celebrations in September.